A pet urn of true distinction and taste. Strikingly handsome and of the highest quality, these pet memorials are made from designer resin (the same material our Original Edition pet cremation urns are made from). The Library Edition offers a discreet place for your pet to rest and an attractive inclusion in almost any room of your home or office. Available in three sizes, the Library Edition pet urns come in two accent colors and with customized titles. 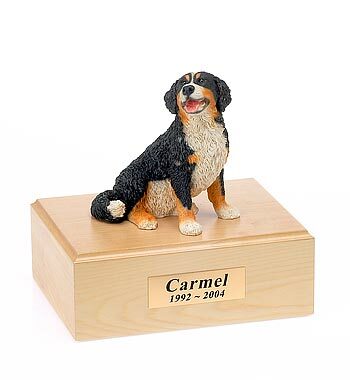 To make your pet urn even more special, add a masterfully crafted figurine. The Library Edition pet urns are available in three sizes: Keepsake for pets up to 30 lbs, Two Books for pets up to 70 lbs and Three Books for pets up to 115 lbs. The Keepsake and Two Books have two sets of titles and the Three Books, three sets. You'll have a truly unique pet cremation urn because our figurines are masterfully crafted with stunning detail. Choose from a variety of dogs, cats, rabbits, ferrets, parrots and horses. Personalize your Library Edition pet urn with matching color leatherette titles. Titles include: Best Friend, In Loving Memory, Our Beloved Pet or Angel Ashes. You may also have your pet's name and dates as one of the titles on your pet urn. Additionally, you may set aside one of the title areas to place a photo of your pet. The Books have a full-length hinge, allowing you to easily place your pet's bagged cremains or personal items, such as collars or tags, into the pet urn. The interior surfaces of the Books are lined with black felt. The Books are held closed by magnets. I did receive the shipment; it is beautiful, so thank you. As well as being a cat lover, I'm also a book lover, and these Library Edition urns are just the most wonderful idea. It's a great comfort to have them snuggled in with all my books. I guess you can tell I have more then one of these; I have lost two of my dear friends in the last year. Thank you and your company for your care, concern, quality of service and product. It all means a great deal.